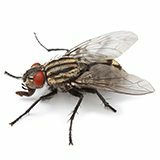 House flies get their name because they are the most common fly in and around homes; however, they occur everywhere. House flies can fly up to 20 miles but, when food is available, will usually remain within 1-2 miles/1.6-3.2 kilometers of their larval habitat. For egg laying purposes, females seek warm, moist organic material. Odors and temperatures attract them to buildings. House flies are most active during the day in warm weather. House flies are not only a nuisance pest; more importantly, they can be a carrier of many disease organisms, such as typhoid fever, cholera, diarrhea, dysentery, tuberculosis, anthrax, ophthalmia, polio and salmonellosis, as well as parasitic worms, which they can transmit via vomit, feces and contaminated parts of their body. Controlling house flies is of major importance in maintaining food safety. Dull gray; thorax with four dark stripes. Adults measure 1/8-1/4 of an inch (4-7.5 millimeters) long; the female is often larger than the male. Dull gray; thorax with four dark stripes. House flies feed on a wide variety of moist materials – from excrement to human foods. Adult females lay white, oval-shaped eggs in moist materials that hatch within eight to 20 hours. Depending on conditions, developmental time (egg to adult) can take six to 12 days. Adults can live 15-25 days. As with green bottle flies, keeping house flies out of a facility to prevent food contamination in the summer is a challenge, especially later in the summer when fly populations are huge. It’s also difficult where there are abundant breeding sites (e.g. farm manure) within a few miles.